For other uses, see Fork (disambiguation) and Forks (disambiguation). 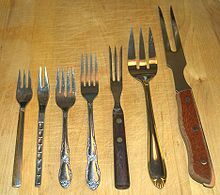 A fork, in cutlery or kitchenware, is a tool consisting of a handle with several narrow tines on one end. The usually metal utensil is used to lift food to the mouth or to hold ingredients in place while they are being cut by a knife. Food can be lifted either by spearing it on the tines or by holding it on top of the tines, which are often curved slightly.